The Truth About Jen’s Empty Blue Square in the Marginalia | Thoughts On "S"
Here are some observations about possible clues to understanding the truth behind Jen’s empty blue square on p10 (Chapter 1) in V.M. Straka’s Ship of Theseus. The word true/truth is mentioned four times in Chapter 1. Then, next to Jen’s square, Eric writes OK – HERE’S THE TRUTH. Is the square the truth? Does it lead to the truth? Perhaps it symbolizes the truth. The Square, a book that appears to tell the hidden story behind the event with an indisputable ring of truth and access to little-known details and facts that have since been proven to be true. ‘S the truth (p18) is suspiciously punny. Eric comments there in the margins that VMS may be indicating that the S represents the truth. The last mention of truth in the text of Chapter 1 (p22) introduces S telling Sola that something happened to my memory. Rather than respond, Sola reaches for her drink and takes a long, thoughtful sip – and all the while The Archer’s Tales sits beside her. While Sola drinks, S’s memory stirs. And the drink and the later waterspouts become connected. The swirling of the drink in the mouth and the swirling winds of the waterspouts. Sola drinks “down the hatch” and the monkey jumps down the hatch. Compare this to the scene where Stenfalk (p150) sits around the campfire with the others and struggles to remember the name of the book where he read about the K__. He takes a drink of liquor and swirls it in his mouth and swallows. He then remembers, The Archer’s Tales. Just prior to this (p149), Corbeau is sharing the story of the K__ when Pfeifer challenges its veracity. Corbeau says, It’s a story. Every story has at least a little truth in it. Immediately after Stenfalk reveals the name of the book, S reveals the author and his experience with Sola. They challenge the veracity of his story, but he insists it is true (it’s what happened). In the Foreword (Fn10, xiii) we read It should be noted that, unfortunately, the very last page—the one containing the true ending of Straka’s masterwork—was not among the pages that were retrieved. On p159, Jen points to the footnote and writes Do you think we’re supposed to take this as literally true. Directly next to it is a drawing of the letter X. X marks the spot? On p199, Eric remarks maybe you don’t solve the big mystery, but you find smaller truths. On p234-235, we see Jen and Eric suggesting that VMS and FXC are sending messages to each other through the art – that they want this to be true and maybe that want is causing them to see it. On p240, the last thing FXC tells Eric, while she squeezes his hand, is that everything she has told him is the truth – or as close to the truth as she could make it. On p284, S describes the cottage on the top of the volcano on Obsidian Island as being different than the warehouse: its angles true. ALSO: SHE HAD CARMINA BURANA PLAYING—REALLY LOUDLY. SHE LIKED TO WRITE W/ IT ON B/C HE LOVED IT—TOLD HER SEVERAL TIMES THAT IT HAS THE TRUEST, MOST INTENSE EXPRESSION OF PASSION HE’D EVER HEARD—FAR MORE SO THAN ANYTHING HE’D EVER WRITTEN OR COULD EVER WRITE. On p423, as Sola and S stand before each other, preparing to execute their plan to defeat Vevoda, S remarks Those visions weren’t false, but this one is true, and the difference between the two is vast. On the same page (423) Eric tells Jen I love you for the first time. He mentions in that section that he loves Jen in negative space, admits he does not know what that means, but then says I’m pretty sure it’s true. Eric and Jen repeatedly comment how amazed they are that FXC’s footnotes are true in Chapter 10. The reason is FXC’s secret – or our secret. In the alt ending, more important than precious story and its circulation of truth, is Sola. What is most important to him is Sola. His story. Chapter 10 overall culminates with S’s change of heart, where he chooses not to deliver a lethal dose of poison to the crowd, and chooses to target Edvar Vevoda VI with Avis veritatis “the bird of truth”. Six is the planet at the center of the gala, the axis around which the party whirls. Edvar delivers truth to the crowd in his speech: draw near, gentlemen, draw near, do not miss any of these words, for this is Truth and it is a miraculous thing! Every use of the word absurd in S seems to be a companion to the word truth, where the actual truth seems impossible but really may just be true. Interesting that as Jacob reads this book about rising and converging, John Locke is falling downward. And notice that the cover includes a bird and “archery” converging. Here is a pic of the squares in HoL. http://3.bp.blogspot.com/-M7bAqJaotto/Tcf3OHgUMfI/AAAAAAAAABE/ICoW2lUDBXg/s1600/house_of_leaves.jpg and here also: http://kzamanis.files.wordpress.com/2011/12/house-of-leaves-001.jpg Here is a comment about a blue square in HoL. 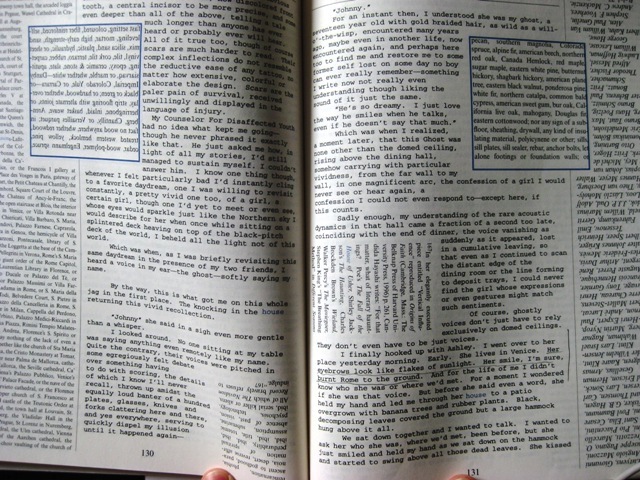 http://engl146.wordpress.com/close-readings-of-house-of-leaves/#comment-40 A comment about a blank square: https://distractedreading.wordpress.com/close-readings-of-house-of-leaves/#comment-69 I haven’t read HoL. This is just a google search. Hope that helps. Thanks, geekyzen. Great content for research. Pingback: Is “S” on a Walkabout? | Thoughts On "S"
The 4 is referenced often as well as the three, sometimes even together. Most likely in the first chapter this is a reference to the base of the pyramid 4, and the three is the number of points for one of it’s sides. As far as this theory goes it would be strengthened by the large number of references throughout the first chapter relating to the Ancient Mystery Schools, Ancient Geometry, and Ancient Arithmitic. All of these references point to Egypt, so a pyramid makes sense numerically as well as the references to the Root society heavy in the first chapter which Egypt can be described as. All of the Ancient mystery schools which included teachings of geometry and arithmetic came out of Egypt. Pingback: Jen’s Blue Square on p10 | Thoughts On "S"